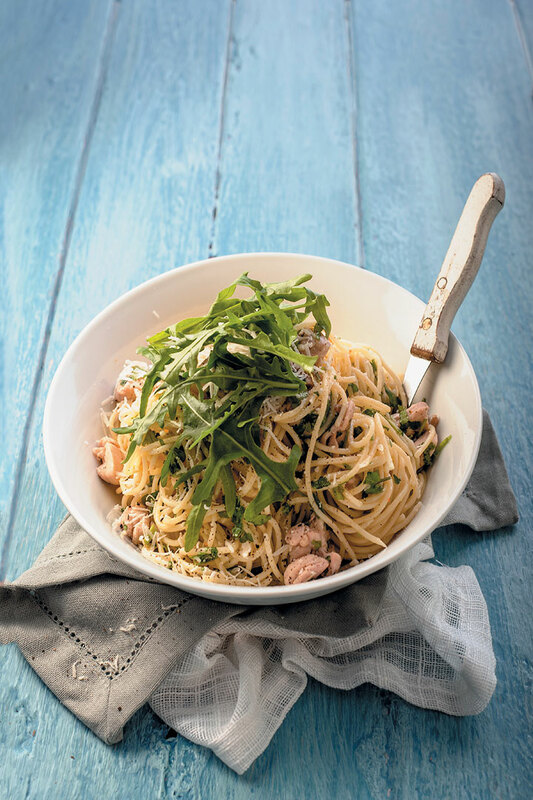 Chicken, coriander and lemon spaghetti is full of fresh herb flavours. Light meat is perfect with the sweet nuttiness of coriander and sharp lemon. This pasta is great for summer – zesty and fresh minus all the heavy sauces. Bring a large pot of salted water to a boil. Cook the spaghetti according to packet instructions, drain, drizzle with olive or avocado oil and set aside. Heat a large non-stick pan over high heat and add 30ml (2 tbsp) olive or avocado oil. Fry the chicken until golden, add the garlic and chilli and season well. Fry for another minute and add the chicken to the cooked pasta. Add the coriander, parsley, lemon juice and zest, and season. Add the remaining oil – you may need another 15 – 30ml (1 – 2 tbsp). Add grated Parmesan to the pasta and mix well. Serve with plenty of grated Parmesan and rocket. To drink: A dry riesling has zingy acid but aromatic, perfumed flavours that suit Asian herbs like coriander.